The RHINO name promises the strength, permanence, and top-grade materials for your agricultural steel buildings. Regardless of the size or specific application you need, we have steel farm buildings or agricultural storage buildings to exactly fit your requirements. Steel is the greenest way to build. Steel is the most recycled material in the world. RHINO’s steel framing is high-tensile commercial-grade steel with an average recycled content of 89.5% making it a great choice for metal farm buildings. Our agricultural steel buildings provide better protection from high-winds, lightning, fire, mold, earthquakes, termites, and aging than any other building system. If needed, RHINO metal farm buildings can be insulated for year-round energy-efficient comfort. With our Pro-Value Insulation Package, climate-controlled agricultural buildings can save as much as 50% on energy bills. RHINO’s prefabricated steel agricultural buildings arrive at your farm or ranch ready to be assembled with simple bolt-together construction, like a giant erector set. Many farmers and ranchers erect their own steel farm buildings with a few friends, like an old-fashioned barn raising. RHINO buildings provide top-quality materials at a surprisingly affordable price. Agribusiness structures need lots of open, unobstructed space and RHINO ag buildings deliver, with 200’-wide or more clearspan structures and wall heights from 10’ to 40’ (or even more on custom quotes). RHINO’s framing is guaranteed to meet or exceed all local building codes and loads for the lifetime of the structure! Our building kits contain additional perks as part of the standard package, including extended-life cast zinc aluminum self-drilling screws, overlapping purlins for added strength, ultra-strong steel PBR (Purlin Bearing Panels) for roof and metal building panels, as well as door and wall frame trim. The kits also included many waterproofing features like die-formed ridge caps, foam rubber closure strips, and formed base trim for the steel panels. RHINO steel farm buildings are easy to remodel and expand later. More framing can be added to either end wall to increase space as needed. 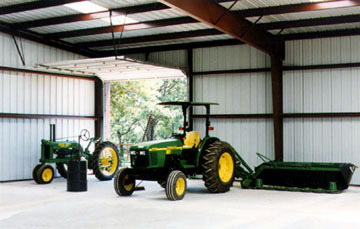 Our durable, sturdy, attractive agricultural steel buildings are practically maintenance-free. 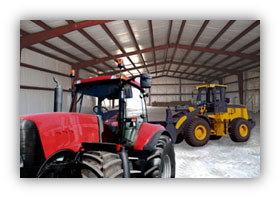 Whether you need a barn, a hay shed, a covered open air or indoor riding arena, a stable, a livestock or dairy barn, a storage building for farming implements or commodities, a machine shop, a multi-purpose building with an office, or a hangar for a crop dusting plane or helicopter, RHINO can fabricate the right building to suit your agricultural building needs perfectly. RHINO is a name you can trust for agribusiness metal farm buildings with decades of problem-free service. Our staff of experienced metal building technicians is available to answer any questions and to assist you in selecting agricultural steel buildings and steel farm buildings for sale. Call us today at 940.383.9566. Share the post "Agricultural Steel Buildings"